2 Free single swatches of any fabric we sell. Please enter all your choices at the same time to receive the discount, which will be applied at checkout. Enter all of your choices at the same time to get the discount. 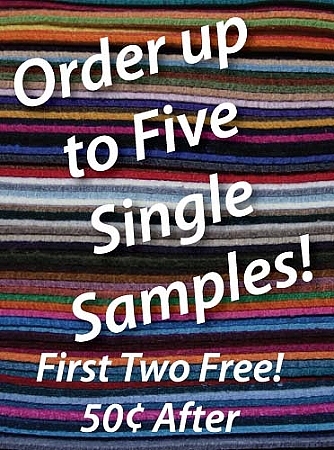 If you would like only two Free Samples, Choose "Free Sample" in the payment option during check out. Or use our Contact Us form [please include your address for faster service]. Free Shipping in the U.S. Only - faster shipping options available. Each Sample is approx. 2" x 2".